Welcome to The Portlandia dress. Why Portlandia? Because it’s got a bird on it! This pattern was uber easy to put together, but I must quote Roisin here – ‘once you get over the needlessly baffling instructions’ (have you seen Roisin’s version? Gorgeous!). Basically Pattern Runway split out every bit of the dress and then give you yardage for each section so for maths durrs like me it was impossible to try and work out how much actual bladdy fabric I needed. Cue lots of cantering from sewing room to sewing table, arms filled with fabric, excitement turning to disappointment and a certain amount of mewling (yes I mewl, don’t you?) when I would realise that successive fabrics which would have been just perfect, weren’t sufficient enough to the task. 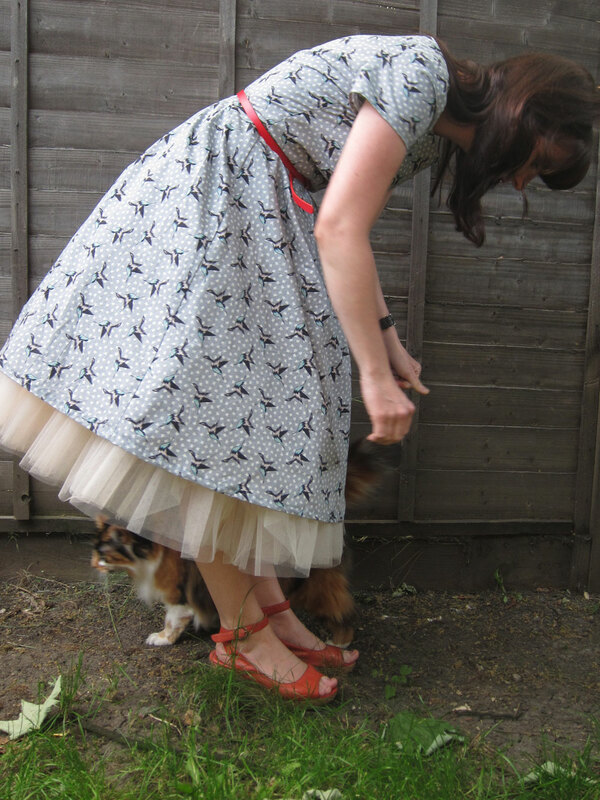 I’ve worn this dress all day without the petticoat – not too creased eh? 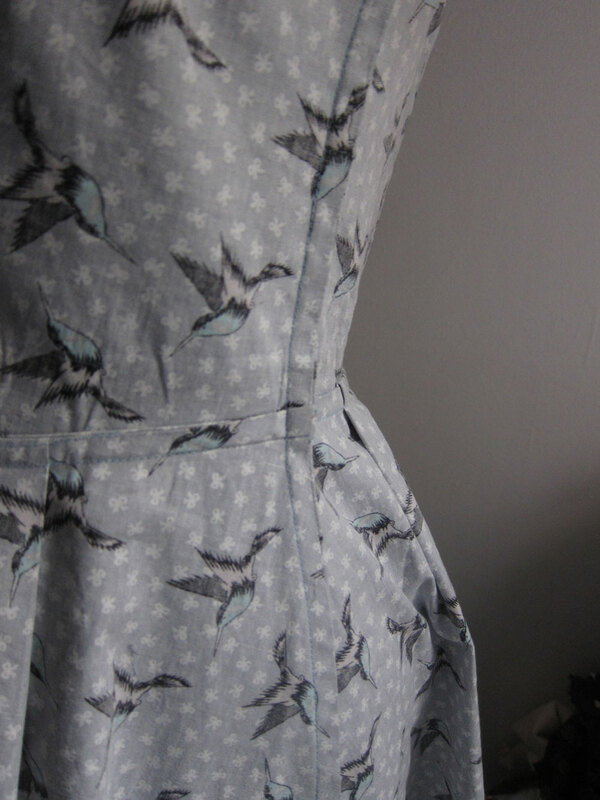 But not my ‘Put a bird on it!’ fabric, hooray. Three metres was just enough to squeeze a dress out of. A lot of fabric goes into this skirt, and unfortunately the folded fabric was too narrow for the skirt pattern pieces, so I had to cut two identical lengths of fabric, place them right sides together and cut out the skirt pieces separately. I used two pieces roughly 125 cms in length for the skirt, facings and sleeves and I was left with about 50 cms left for the bodice so I did that double fold thing, you know, where you have the fabric folding in on either side to the centre. Psst, I actually have a bit of selvedge in my seam allowance on the centre back bodice – it was that tight. 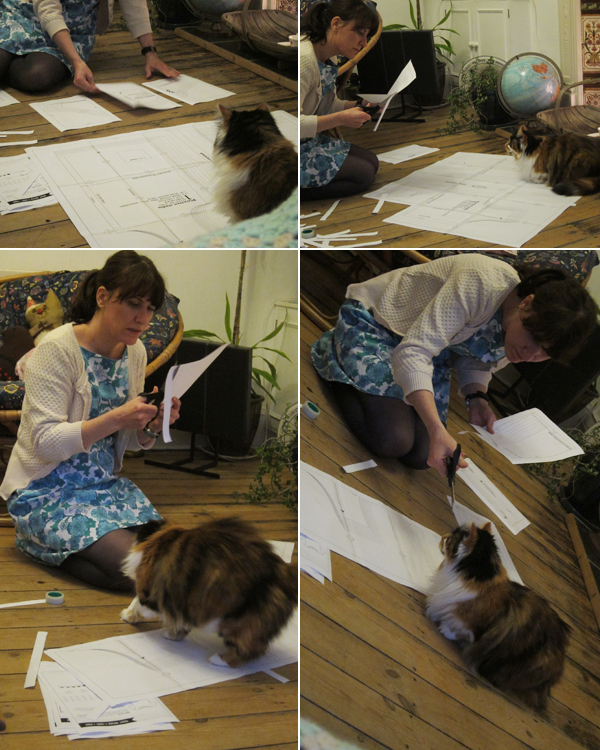 Anyway – on to the actual pattern! I cut out a size 12 exactly as was on the pattern after flat-measuring the pattern pieces, adding ease and subtracting seam allowance. It’s almost spot on but there will be some adjustments to make. 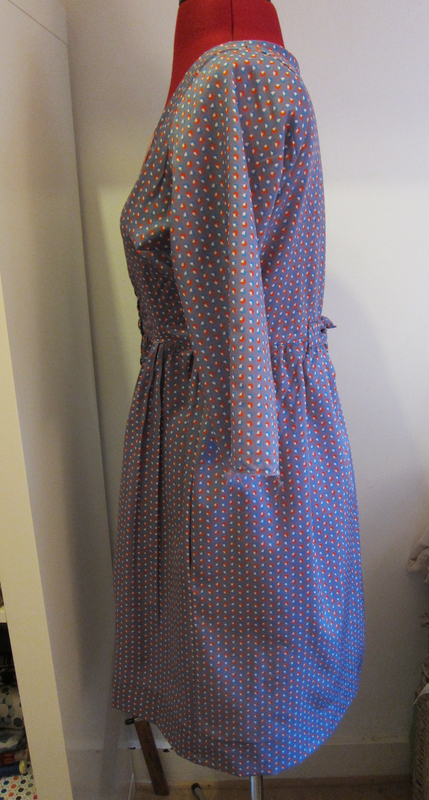 I’m going to remove an inch or so from the neckline front and probably two inches from the back. This will neaten the shoulders and stop that dreaded bra strap from showing as well as removing any gaping at the back neck. I’m really happy with the waist – it has just enough ease to be comfortable but not so much it looks cinched in when I wear a belt. The double darts in the bodice are a first – I love how they pull the bodice in so elegantly. But this is such a simple dress there really are no special skills required to complete it. It would be a great project for a beginner. I really made an effort to finish the seams nicely on this dress so everything is French seamed with the exception of the armscye seams and the bit of seam allowance under the zipper – I’ll try and work out a good way to do that for the next version but I find sleeves and zippers stressful enough without trying to French seam them! It was a little daunting at first but the effect was so lovely and neat. For those who don’t know what a French seam is – it’s basically enclosing the raw edges within your seams. Here’s how to do it. 1. With wrong side to wrong side (I know, weird innit) sew a 1/4″ seam allowance. Trim the allowance to about 1/8″. Press the seam both sides. 2. Now turn the edges right side to right side (like how you’d normally sew a seam) and sew a 3/8″ seam allowance, thus enclosing that previous seam within your new seam and hiding any nasty raw edges. 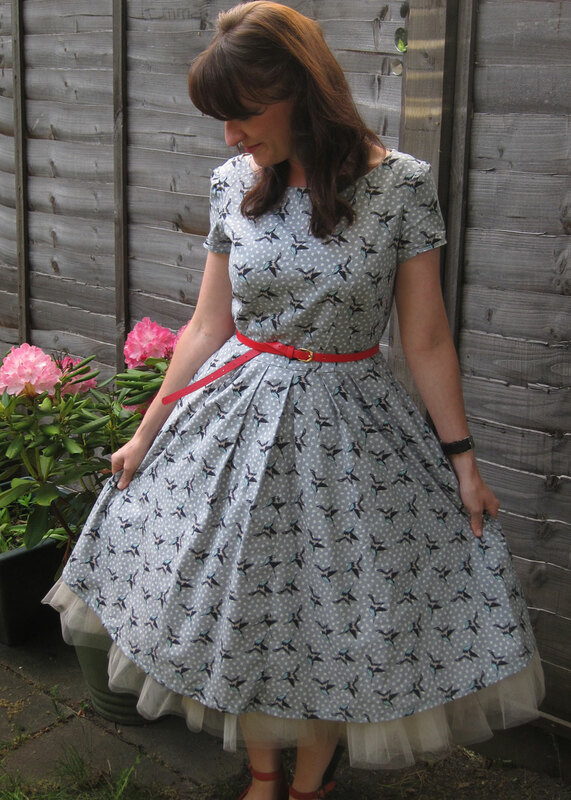 Press as usual and marvel at your gorgeous 5/8″ neat seams, sans overlocker! Please note if your seams are supposed to be 1/2″ or otherwise you may have to revisit the maths. 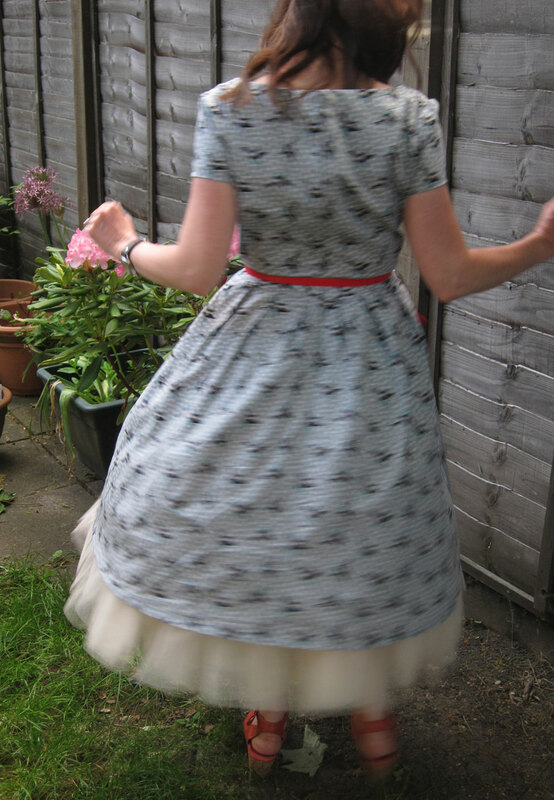 This particular pattern is perfect to try the technique with, as rather bizarrely it encourages you to attach front bodice to front skirt and back bodice to back skirt before you sew the side seams. Will you make this dress again? There will be many versions of this dress I suspect. I really liked the stand up collar that’s included in the pattern but my next version will probably have a self drafted contrast Peter Pan collar and probably be lined. I’m thinking something in navy blue with a cute design (maybe even polka dots! 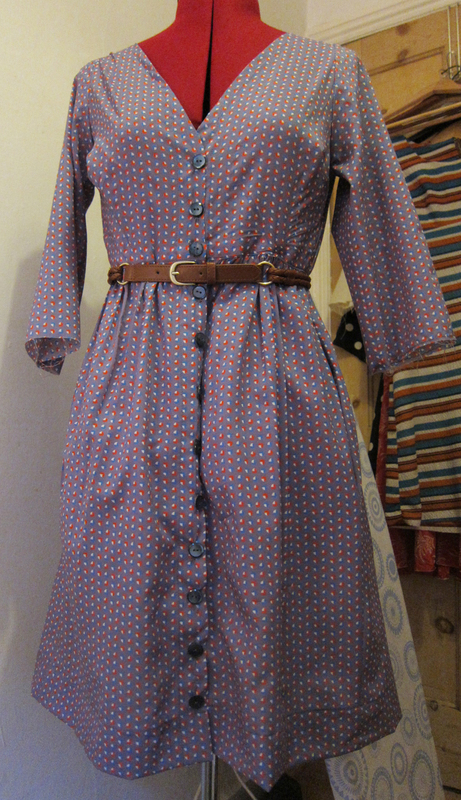 ), a white peter pan collar, piped sleeve cuffs and perhaps a slightly shorter skirt. Another silky evening version might have 3/4 length sleeves and a matching belt. Oooh the possibilities. You could even draft your own skirt – the bodice would look very slinky atop a wiggle skirt. It would also be really interesting as a fine wool knit for winter. Pattern – £6 including delivery. I cut everything out in a couple of hours on Friday night, spent about three hours in total on it on Saturday and another three hours on Sunday so approximately 8 hours. Did I mention I love this pattern? I simply had to share this – some vintage Pathé footage of a Butlins holiday camp competition. The challenge? To make your own bikini from scraps of fabric and a bit of string, then model it proudly as 100 men in dodgy shorts look on lustily. Nice. Although it’s all terribly sexist and objectifying, when you compare it to today’s wet t-shirt competitions and worse… it all seems rather modest and innocent, non? If entirely wrong of course. You’ll find no nostalgia for sepia-toned sexism round here. Oh May, will you EVER end? But there again, with weather like this, do we want it to? Here’s my round-up of last week’s outfits (with a few newcomers not seen before in May – hooray!). Monday: I haven’t worn it in ages and I can’t think why because it’s so sweet! The Whale of a Time blouse, here worn with grey trews and Mango cardy. 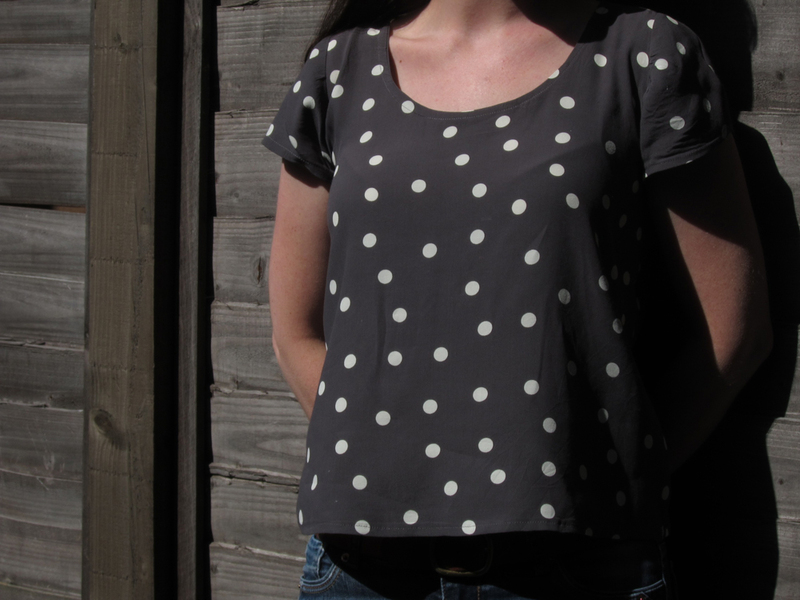 Tuesday: The pollkadot Scout tee worn with matching/clashing (you decide?) polkadot yellow scarf and navy trews. Wednesday: The trusty Violet makes what must be its 3rd or 4th outing this month. Thursday: It was so hot on this day that a tee-shirt was the only answer so I grabbed my faithful Robot bag as my me-made item today. Friday: A quickly thrown together scout tee made from just 70cms of slinky knit fabric! Yet to be blogged. Saturday: Ahh a night in with Gracie – in me-made pyjamas. Sunday: A sneaky preview of Simplicity 2444 down the pub, my new favourite make and soon to be blogged about dress… watch this space! We’re. Almost. There. May is a sneaky month… spread over five weeks like that. She’s no better than she ought to be as Mammy would say. I’m looking forward to the end but I feel my spirits have lifted somewhat after last week’s doldrums, not just with the advent of good weather, but also a few new (successsful) makes. Onwards! Ooh doncha hate it when something you had high hopes for doesn’t quite match up to expectations? 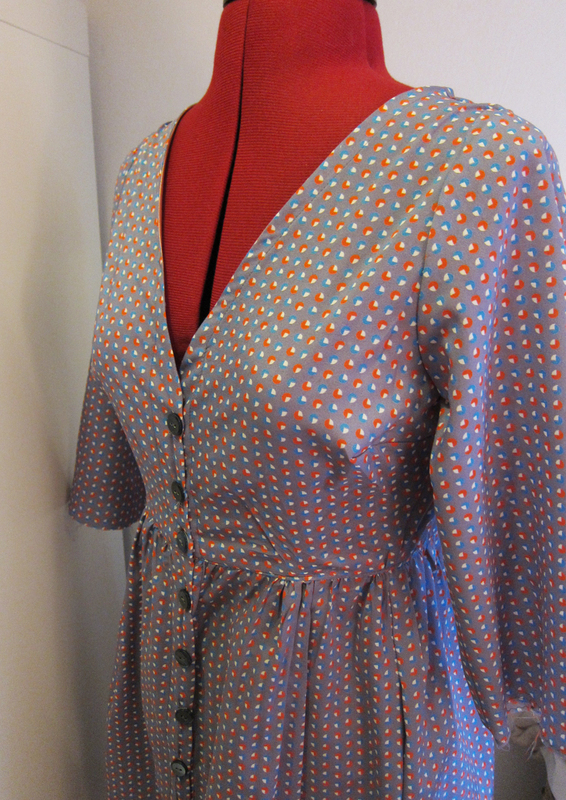 I’ve almost finished my Darling Ranges wearable muslin and (shock! gasp!) I’ve decided not to finish it off. I’ve just got the sleeves to do but nope, it ain’t happening? Why? Because contrary to how this charming dress looks on the mannequin, it makes me look like a sack of spuds. This isn’t false modesty either peeps, it really does. A few tweaks during construction to even out some flaws in the pattern measurement (see Roobeedoo for a breakdown) meant that a shortish bodice went even shorter than anticipated. The bodice stops at what must be the single most unflattering part of my ribcage – effectively widening my overall silhouette by, ooh, about a metre or so and enveloping the lower half of my body in what can only be described as the upper half of a deflated blimp. So I’m ho-humming about where to go next with this dress. On the one hand, I can jump straight into making the necessary tweaks to the pattern, lengthening the bodice by an inch or so, maybe cut a size bigger in the bust area, use my wonderful new fabric donated by Our Patterned Hand… I think I’d definitely make a calico muslin this time though, rather than waste more fabric! 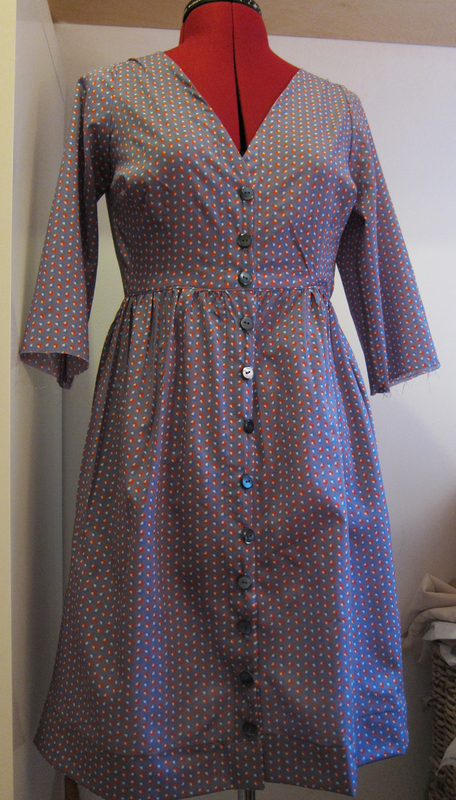 Or I might take a break, do something else and come back to this dress refreshed and ready to tackle its challenges. Yeeesss, you might notice that this week starts on Tuesday. I don’t know what happened to Monday. Either I forgot to take a pic or I’ve inexplicably lost the pic I took or I spent Monday in a coma. I’m pretty sure I was wearing me-made – I just have no idea what! I’m getting a wee bit fed up now seeing myself in the same stuff every week, but am determined to see it through. I still feel like I’ve not quite got the hang of it this year and haven’t got the time to really put thought into my outfits. Plus I feel like I’ve worn all these things so much already (in advance of MMM) that I’m not making some extra special effort. 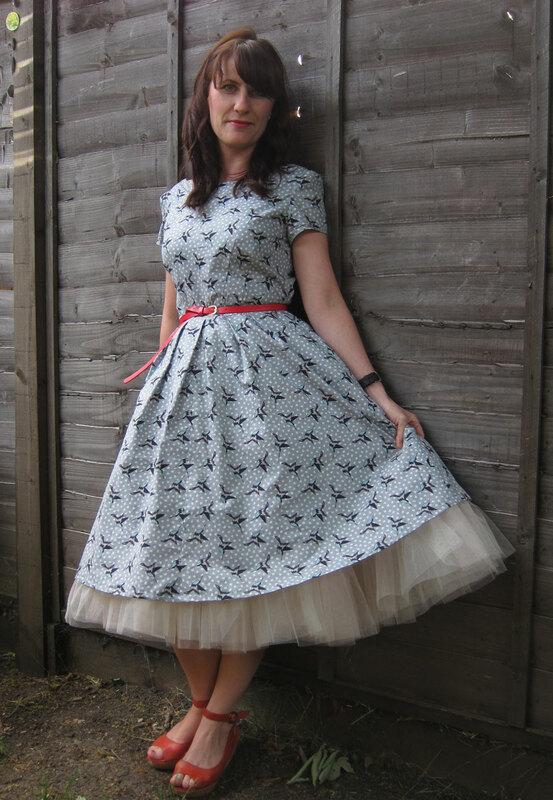 Ideally I’d be wearing the stuff that’s not worn so frequently – like all the dresses I’ve made. But they’re just not right for work! The weather hasn’t helped to be honest – I think we’re all feeling a little grey here in the UK – May seems to have cheated us! A rather amazing and wonderful thing happened to me last week. 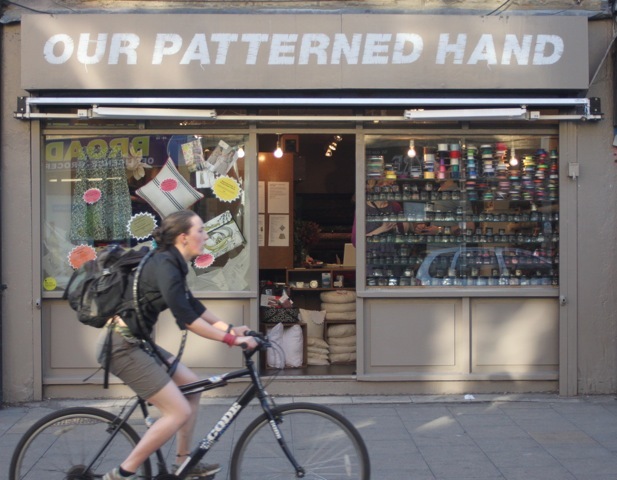 A fabric shop based in East London, called Our Patterned Hand, got in touch with me. Having followed the blog for a while and knowing that I was a local stitcher (local as in London and north of the river I guess!) they made the unbelievably generous offer – any fabric of my choosing from the shop, gratis, in return for just a mention on the blog. Now, I’m not proud and this is the first offer I’ve ever received from a fabric or haberdashery supplier so obviously I bit their giving hand off at the wrist. Soon I was arranging a time to pop over to the store, located in the midst of the hipster heaven that is Broadway Market. If you haven’t sampled this amazing unique place yet, I urge you to take a Saturday or Sunday morning visit there for a coffee and a wander. The food stalls are out of this world, there are lots of little vintage furniture stores and stalls and it’s just fascinating sitting back and watching all of human life pass by. I lurked for a while at the back of the shop listening in while Hannah, an unflappable woman, answered queries about needles and fabrics, books and binding. I was discovered in my lurkery by Leanne, the owner of Our Patterned Hand, who had so kindly made the offer. Leanne the owner – her 10 year old daughter made that top you know! 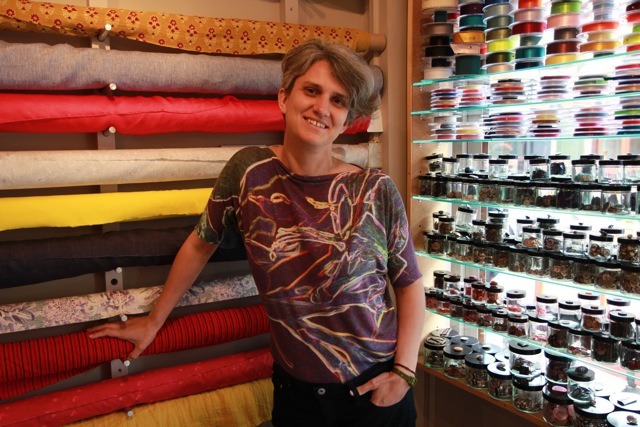 Leanne’s background is in fashion, she worked as a pattern cutter for many years before starting a family so the shop is very much geared towards dressmaking fabrics with interesting and quirky prints, Liberty lawns and poplins, Irish linen and Harris Tweeds. 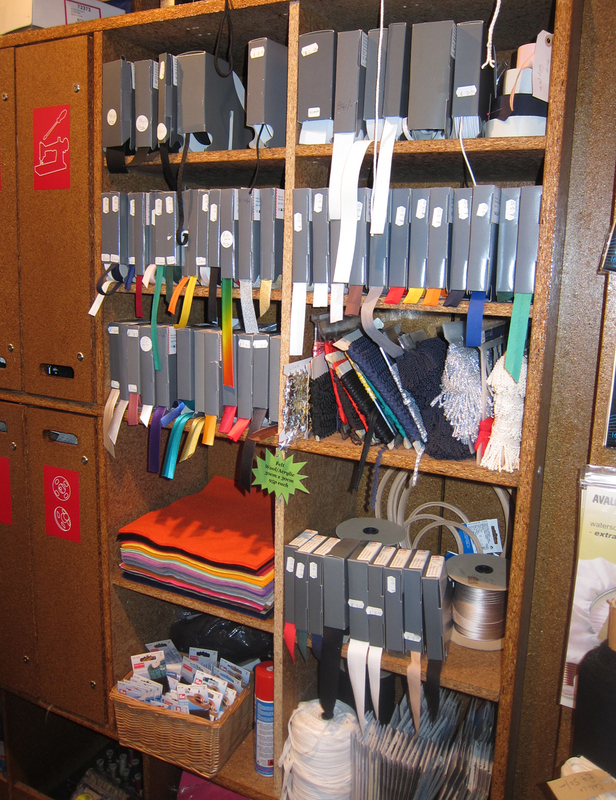 It’s also the first fabric shop where I’ve noticed a mirror hanging up so you can check the fabric against you. Now I know this is a tiny detail but can anyone say they’ve noticed this in other fabric shops? I know there isn’t one in John Lewis haberdashery, and pretty sure there’s not one in McCulloch & Wallis or the Cloth House, or any of the fabric shops in Walthamstow market. We’d never consider a clothes shop without a mirror, yet we’d happily buy metres of fabric that we’ve not even checked against ourselves? Anyway – I thought it was a brilliant idea and I guess it must come from Leanne’s fashion background. 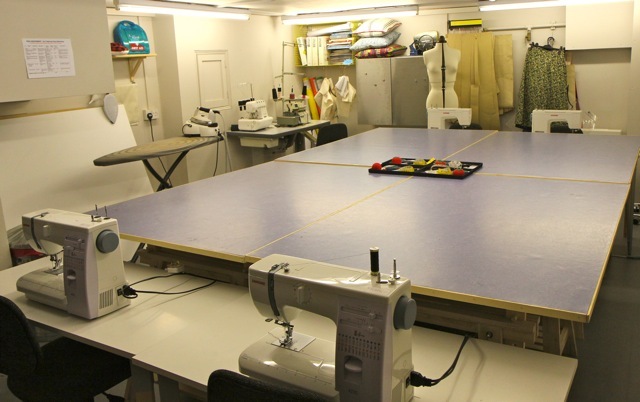 Downstairs there’s a good size studio that caters for small sewing classes and workshops such as How to Make a Gypsy Skirt or How to Make a Kimono Jacket (tip: I’ve seen one of these jackets in the studio and they’re gorgeous so that’s tempting me something rotten). Is that tie-dyed bias binding? Amazeballs! 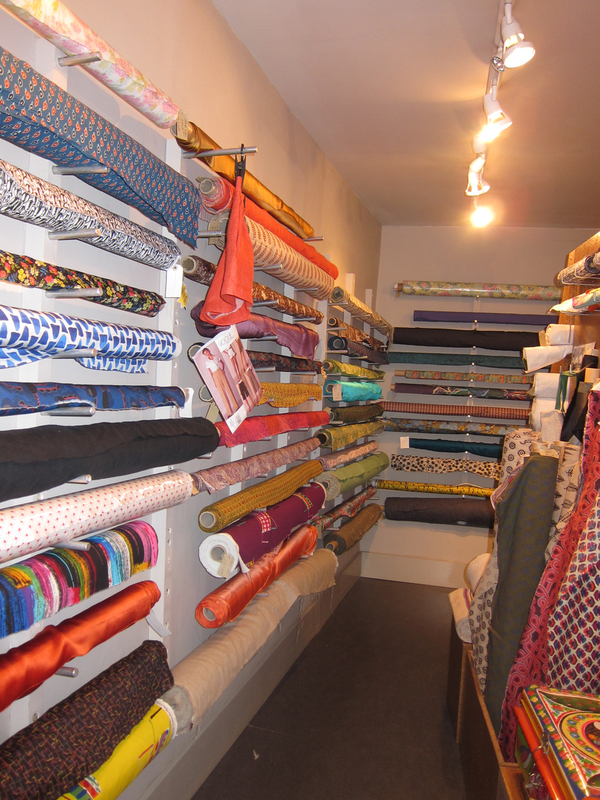 Back upstairs, alongside the amazing fabrics there’s also a well stocked haberdashery, book section, pattern selection and an absolute treasure trove of buttons. Check out this window display. But what did I choose, you’re asking? With all this fabulous fabric to pick from, surely you picked a digitally printed Liberty silk?! Or the finest Irish linen?! Oh no dear readers, I was in the market for something specific – fashion fabric for my Darling Ranges dress, after I finish the wearable muslin that is. I needed something soft and with drape, not too stiff. And something with an interesting pattern. With Leanne’s expert help I picked out three metres of this rather humble but adorable handwoven hand blocked vegetable-dyed Indian cotton, sourced from Gujarat in Western India. And how do I know all that? Because the guys at Our Patterned Hand like to tell the story behind the fabric – they pretty much know all there is to know about every single bolt – check out the website for further proof. I’m so delighted and grateful to Leanne and Hannah for letting me have this for nothing – it really is ridiculously generous of them. And it also gave me my first opportunity to do a Q&A with someone who’s in the business, so watch this space for a interview with Leanne coming up! If you’re in the area, pop in and say hello, It’s one of the friendliest fabric shops I’ve been to, never mind how busy it always seems to be. Definitely worth a visit. So I’ve basically ripped off True Bias and her lovely polka dot T-shirt for this project. Once I saw her slouchy tee I knew it would be perfect for filling that essential casual top gap I’m seeing in my me-made wardrobe. And because I’m a big ol’ plagiarist, I opted to go for spots too! I used this polyester mix from my stash. I had been keeping it for my Hazel dress but since I don’t know when I’m going to be able to start it, I thought why not use this wonderful fabric instead of letting it sit unadored in the sewing room. 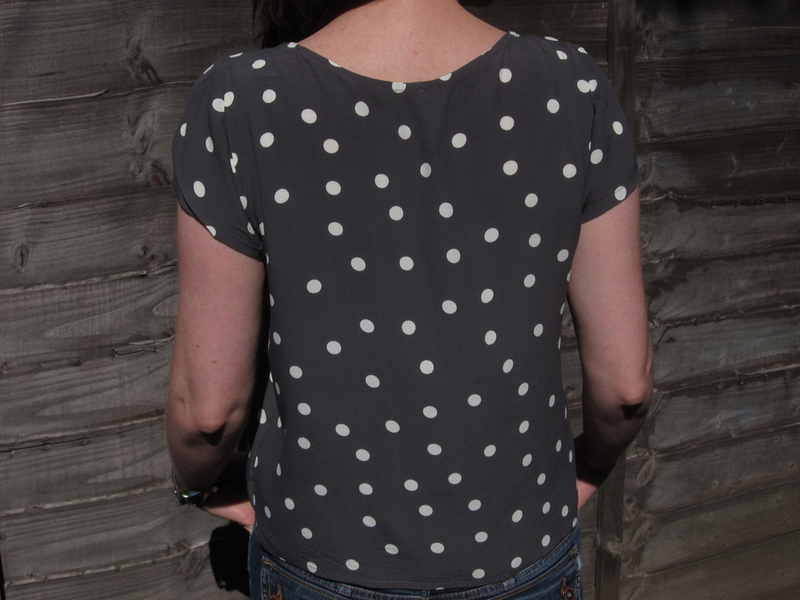 It’s got a lovely drape to it and I love the slightly outsized dots and this particular shade of grey. Anyway – back to the pattern. It’s very easy to put together – just a front, a back, a sleeve and bias binding for the neckline, which is even helpfully added to the pattern and sized for you. It takes a couple of hours for me to knock one up but the more experienced amongst you will be knocking one of these babies out in an hour tops. For my next version I think I’ll reduce the width of the sleeves a touch and not take so much off the length. This could also make the perfect pattern for a slouchy sun dress if you extend it, or a great nightie. Plus you could do all sorts of experimentation with the sleeves etc. Warning – this is not fitted in any way. There are no darts at all so if you do prefer something a bit more fitted, this pattern might not be for you. But if you’re after an easy to knock up, casual slouchy tee for lazy summer days – this is it.